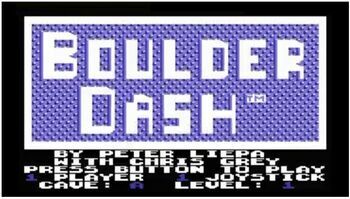 Boulder Dash was one of the more popular action-puzzle games of the 8-bit era. First released for Atari 8 Bit Computers in 1984 and endlessly ported, including to the NES and Virtual Console. In it, the hero Rockford must explore a series of caves/levels, collect a certain quota of diamonds, and reach the exit without dying. Depending on how a level is designed, it could be evocative of Block Puzzles like Sokoban or a hectic arcade game similar to Dig Dug, minus the player's capacity to directly defend himself. Boulder Dash's primary feature is that boulders and diamonds are subject to gravity, but the player is not. A stack of rocks and diamonds will roll off of each other into a pile if there is room to do so. A careless player may find himself crushed or trapped beneath a mountain of rubble. Certain enemies, when killed, explode into diamonds which can either be collected or kill enemies or players beneath them. Other enemies simply explode, like highly mobile Exploding Barrels, which can be necessary for blasting a hole in a wall. Boulder Dash was also a technical achievement, with large, freely-scrolling multi-screen levels potentially filled with falling rubble and roaming enemies. 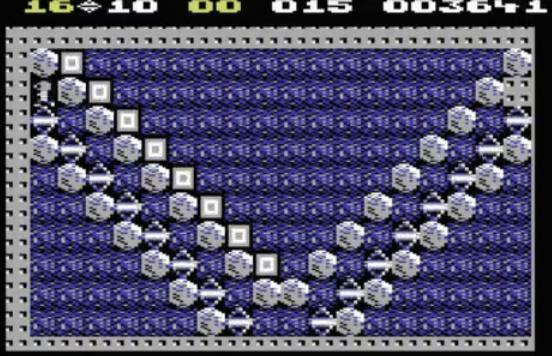 It achieved this effect on relatively underpowered hardware by way of its Invisible Grid; everything moved one "tile" at a time, and enemies were lethal if the player was simply adjacent to them. Arcade Perfect Port: Inverted, as bizarre as that may sound. Boulder Dash was the first game to be ported from a home computer system to the arcade. Brutal Bonus Level: the V-shaped (and thankfully optional) bonus round, depicted here. Crowning Music of Awesome: the Game Boy Advance title, Boulder Dash EX, is an Adaptation Expansion of sorts, since it adds an enhanced single-player mode (with a JRPG-like plot and Bomberman-like items thrown in the mix) to a Video Game Remake (with the same enhanced interface) of the original hit; but the fact the whole soundtrack can be found on Youtube ONLY in a single video pretty much defines the "Needs More Love" trope. Ear Worm: the title screen may be the only music in the game (not quite: see "Nothing Is Scarier" below), but you know it uses well the limited powers of the Commodore64 when it gets stuck in your head like that. Listen for yourself. Fan Sequel: Visit sites that offer ROM files of C-64 games and you will find literally hundreds of home-grown Boulder Dash sequels. Follow the Leader: Clones of this game eventually emerged. Many, like Supa Plex, were considered an improvement to the formula. The﻿ "last seconds sound"﻿ is still making me pee my pants. Sequel Difficulty Spike: it can be argued that the less-known "Boulder Dash 2", both for the Commodore64 and designed by Peter Liepa, requires the player to have played the first one before the second, given that the very first level of the second requires the player to blast a hole in a wall by killing a dragonfly (the square-shaped enemy). This game mechanic, alongside the Magic Wall that also shows up in the aforementioned first level, doesn't show up until halfway through the first game, and it's usually exclusive to advanced players (trust us on this one). It is All There in the Manual, of course. Then again, not every player had access to the manual. Unwinnable By Mistake: Beyond the ability to ruin your own attempt at finishing a level, some levels are unwinnable. Boulder Dash Intermission 3 is reported to be unwinnable on PAL systems. This optional level is not required to complete the game. Boulder Dash 3 Cave A-5 is unwinnable, with a boulder blocking the entrance. Caves I-4 and I-5 also suffer from unwinnability. This page was last edited on 21 January 2016, at 01:01.